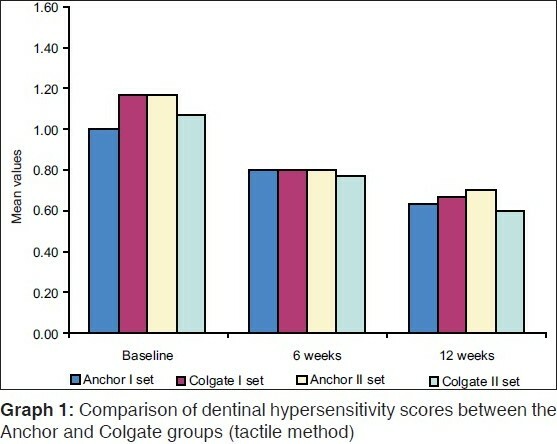 Objective: A parallel design clinical study evaluated reduction in hypersensitivity after brushing for 12 weeks with Anchor toothpaste (containing potassium citrate, zinc citrate, triclosan and sodium monofluorophosphate) (test) and Colgate Total (sodium fluoride, silica, triclosan and copolymer) (control) dentifrices. Materials and Methods: Sixty adults with sensitivity to hot and cold stimulus in at least two tooth surfaces were stratified at the baseline examination by tactile, hot and cold stimuli scores in two balanced groups. Subjects were randomly allocated the test and control dentifrices and evaluated after 6 and 12 weeks of dentifrice use for hypersensitivity. Results: The two teeth that were selected in each patient were designated as two different sets. The 12 th -week scores as compared to baseline scores for tactile, heat and cold tests in the test group showed a reduction in tooth hypersensitivity by 36.67% (P < 0.01), 20.35% (P < 0.01) and 53.64 % (P < 0.01), respectively, in the first set of teeth and 43.75% (P < 0.01), 24.48% (P < 0.01) and 59.78% (P < 0.01), respectively, in the second set of teeth. The 12 th -week scores as compared to baseline scores for tactile, heat and cold tests in the control group showed a reduction in tooth hypersensitivity by 42.86% (P < 0.01), 13.02% (P < 0.01) and 45.14% (P < 0.01), respectively, in the first set of teeth and 40% (P < 0.01), 16.59% (P < 0.01) and 44.16% (P < 0.01), respectively, in the second set of teeth. Conclusions: Both the products reduced dentinal hypersensitivity in the study subjects at the end of the 12-week period. However, there was no statistically significant difference in reduction in hypersensitivity between the two products. The oral cavity presents an assorted variety of diseases, among which dental caries and periodontal disease are two of the most common. A less common yet painful condition affecting the oral cavity is dentinal hypersensitivity. Dentinal hypersensitivity has been recorded for over two millennia, and the earliest documented treatment method was opium therapy, which dates back to 400 BC, being advocated as recently as 1000 AD. Dentin hypersensitivity may be defined as the pain arising from exposed dentin, typically in response to external stimuli, and which cannot be explained by any other form of dental disease. This condition may disturb the patient during eating, drinking, brushing and sometimes even during breathing. Sensitivity to thermal stimulus - heat and cold - seems to be the most prevalent complaint presented by hypersensitive individuals. In general, the incidence of hypersensitive dentin ranges from 10 to 30% of the population. A majority of patients however do not seek treatment to desensitize their teeth because they do not perceive dentinal hypersensitivity to be a severe oral health problem and prefer over-the-counter products when the problem becomes severe. Dentin hypersensitivity manifests itself as discomfort, which may be dull or sharp, vague or specific and intermittent or constant. Several hypotheses have been put forward over the past 100 years or so to explain this manifestation. Various models that were put forth included the direct stimulation theory, odontoblastic transducer mechanism, gate control theory and the hydrodynamic theory, of which the hydrodynamic theory is considered to be most plausible. According to this, rapid shift in the fluid flow within the dentinal tubules appears to be responsible for causing odontoblastic pain. This theory postulates that fluids within the dentinal tubules are disturbed either by temperature, physical or osmotic changes and that fluid movements or changes stimulate baroreceptors, which leads to neural discharge. Dentinal hypersensitivity, while neither life-threatening nor a serious dental problem, can be a particularly uncomfortable and unpleasant sensation for patients and can dictate types of food and drink ingested. The condition is, nevertheless, of sufficient concern to warrant appropriate and proper management. In most instances, the condition can be managed by patients through appropriate home care using properly prescribed over-the-counter products. covering or plugging dentinal tubules using agents such as ions and salts, dentin sealers, protein precipitants, periodontal soft tissue grafting and lasers. Of these three methods, the third method is the most popular method used. Owing to the relatively reduced severity of the problem, over-the-counter home care products are generally preferred. Pain associated with dentin hypersensitivity can be evaluated by various methods. Traditionally, the individual patient's responses to presenting stimulus in the form of verbal rating, visual analogue scales and questionnaires have been used. ,, The more reliable objective estimation includes the use of tactile stimulation using a calibrated probe like the Yeaple probe, chemical (osmotic) stimulation, the use of electrical stimuli, evaporative stimuli and thermal stimuli like the thermodontic stimulator. ,,,,,,,,,, Hence, one can observe that during the years, clinical methodology has evolved from monadically designed, subjective investigator reports to present-day, double-blind, placebo-controlled clinical trials employing stimuli that are quantifiable in physical units. Recent years have witnessed an upheaval in the socioeconomic conditions in developing countries such as India. There is growing awareness about oral health among Indians, especially in its urban centers. There has also been an increased availability of oral health care products in the country, each claiming to be more effective than the other in improving the oral health of the consumers. 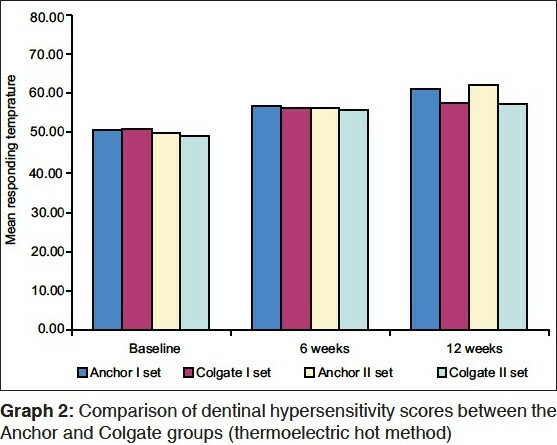 There is a definite need to evaluate the effectiveness of these commercially available dentifrices, and the present study was conducted with the purpose of comparing the efficacy of Anchor toothpaste as compared with other benchmark products in reducing dentinal hypersensitivity among the adult population in the city of Dharwad, Karnataka state, India. 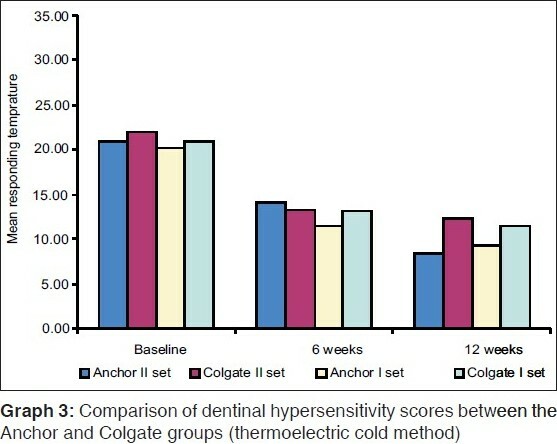 Therefore, the working hypothesis of the present study was that the test product (Anchor dentifrice) was more effective than the control product (Colgate Total) in reducing dentin hypersensitivity. This was a single center, examiner-blind, two-arm parallel design study. The clinical protocol and written informed consent was reviewed and approved by an ethical committee prior to the start of the study. Subjects in good general health and presenting with symptoms of dentinal hypersensitivity in at least two teeth were considered for enrolment. A dental examiner explained the nature of the study to prospective subjects prior to scheduling an oral examination. Adults (age range 18-65 years) from Dharwad, India, who completed the informed consent form and met the inclusion and exclusion criteria, comprised the subject population. Inclusion criteria for the study included availability for the entire duration of the study, a minimum of 24 natural permanent teeth that were free of large restorations or dental prosthetic crowns. In addition, the subjects had to have at least two teeth from which a painful response could be elicited by the tactile method using a dental explorer. The subjects excluded from the study were those having gross oral pathology, chronic disease and history of allergy to toothpaste, advanced periodontal disease and presenting with a history of periodontal treatment within the preceding 12 months. Individuals on antibiotic and steroidal therapy within the last month and pregnant and lactating women were also excluded. Prospective subjects were examined by an investigator (author no. 4 - Yalamalli M). Individuals meeting the inclusion criteria were enrolled. Following enrolment, the measurement of hypersensitivity was undertaken by two methods: the tactile method ,,, and by the use of a thermoelectric probe. ,,, The tactile method consisted of running an explorer or a straight probe on the cervical/occlusal areas depending on the presence of hypersensitivity and was given a score from 0 to 3 based on the patient's perception of discomfort. This method may not be able to detect mild changes in dentinal hypersensitivity that can occur after product use. Hence, a more sensitive and objective method of assessing dentinal hypersensitivity, i.e. thermoelectric assessment, was also incorporated in the study. A thermoelectric probe was devised by the Department of Mechanical Engineering, SDM College of Engineering and Technology, Dharwad, for the study [Figure 1]. The probe transmits hot and cold temperatures ranging from 0 to 65΀C and the instrument consists of a thermocouple, heating and cooling circuit and a digital temperature indicator. Before the start of the study, a total of 20 study subjects with dentin hypersensitivity were examined at baseline and they were re-examined for reliability of the instrument. The intraclass correlation coefficient calculated for the instrument was found to be 0.9849. Sensitivity of the instrument was found to be 76.92% and specificity was found to be 71.43%. The true positives identified by the instrument were 76.92% and the false negatives was found to be 23.08%. Baseline scores were recorded for both tactile and thermal stimuli in relation to two selected teeth. As the patients were being recruited, they were randomly allocated to the test or control group. Both the groups were balanced with respect to their baseline hypersensitivity scores as assessed by the thermoelectric probe method. Subjects were instructed to brush twice daily with the issued dentifrice and a soft-bristled toothbrush. Enrolled subjects were instructed to discontinue the use of all other dentifrices, mouthwashes, gums and other oral hygiene formulations for the duration of the study period. Test formulations included Anchor toothpaste, a dentifrice with potassium citrate, sodium monofluorophosphate and sodium fluoride, and Colgate Total, a commercially available toothpaste containing 0.3% triclosan, 2% copolymer, advanced silica system (referred to as control), and were supplied wrapped with a unique code (TA = Anchor, TC = Colgate Total). The results were entered into the computer and statistical analysis was performed using the statistical package STATA 9.2. One way ANOVA was performed to assess differences in the variation in hypersensitivity scores between the groups at baseline. ANCOVA was employed to assess differences in hypersensitivity scores between the groups by taking baseline scores as a covariate and Student's paired t-test was performed to assess differences in hypersensitivity scores between treatment periods (baseline, 6 weeks and 12 weeks) in each group. A total of 60 subjects (48 males and 12 females) participated and completed the study and their mean age was 37.75 years. [Table 1] and Graph 1 [Additional file 1] show the results of use of the Anchor toothpaste by the tactile method, which indicates a significant reduction in tooth hypersensitivity from baseline scores to 6 th -week and 12 th -week follow-up. The percentage reduction from baseline to 6 th week using Anchor toothpaste was 20% and 28.13% in the first and second set of teeth, respectively. Twelfth-week reduction of hypersensitivity by around 36.67% was seen in one set and 44% in the other. The percentage reduction from baseline to 6 th week using Colgate Total was 31.43% in both the first and second sets of teeth. Twelfth-week reduction of hypersensitivity by 42.86% was seen in one set and 40% in the other, but no significant reduction was seen between both products, inferring that both products are equally good in reducing dental hypersensitivity. [Table 2] and Graph 2 [Additional file 2] show the results of the heat tests for dentinal hypersensitivity through the thermoelectric probe. The mean temperature of tooth response in degrees Celsius for baseline, 6 th week and 12 th week of follow-up are shown in the Table. It can be seen that on using Anchor toothpaste, the percentage of improvement in tooth resistance against heat on the 6 th week and 12 th week were 12.21% and 20.35%, respectively, for one set of teeth and 13.24% and 24.48% for the other. In Colgate, the percentage of improvement in tooth resistance against heat on the 6 th and 12 th week were 10.4% and 13.02%, respectively, for one set of teeth and 13.27% and 16.59% for the other. The group Anchor in this regard showed better tolerance to heat after using the toothpaste. [Table 3] and Graph 3 [Additional file 3] show results of the cold tests through the thermoelectric probe. The mean temperature of tooth response in degrees Celsius for baseline, 6 th week and 12 th week of follow-up are shown in the Table. One can observe that with the use of Anchor toothpaste the percentage of improvement in tooth resistance against cold on the 6 th week and 12 th week were 43.21% and 53.64%, respectively, for one set of teeth and 32.21% and 59.78% for the other. With the use of Colgate Total, the percentage of improvement in tooth resistance against cold on the 6 th week and 12 th week were 37% and 45.14%, respectively, for one set of teeth and 39.15% and 44.16% for the other. The Anchor group showed significant resistance to cold between the 6 th and 12 th week in comparison to the Colgate Total group. Overall, the tolerance to cold was better in the Anchor group than in the Colgate Total group, even though the difference is minimal. At-home methods tend to be simple and inexpensive and can simultaneously treat generalized dentinal hypersensitivity affecting many teeth. Toothpastes are the most widely used dentifrices for delivering over-the-counter desensitizing agents. The present study aimed to evaluate the reduction in tooth hypersensitivity in subjects over a period of 12 weeks. The duration for most studies that examined the effects of reducing dentinal hypersensitivity ranged from 4 to 12 weeks. ,,, Holland et al. have indicated that trials on hypersensitivity should last for a period of at least 8 weeks. The present study was conducted to assess the long-term effect of use of the dentifrices under investigation. Results indicate that there were significant reductions from 6 weeks to 12 weeks for the tactile method in both the groups and for the thermoelectric method in the test group. Investigators have noted that the confusion derived from the highly subjective nature of participant reporting makes it extremely difficult to evaluate the pain objectively. In the present study, the evaluation of dentin hypersensitivity was performed using a combination of subjective and objective methods. The subjective assessment consisted of tactile stimulation, while the objective estimation was undertaken using a thermoelectric probe. This probe consisted of a thermocouple, heating and cooling circuit and a digital temperature indicator. It has a distinct advantage over the other subjective methods in that it offers the investigator control over the exact temperature that can be delivered on to the tooth surface. Most of the studies that have explored dentin hypersensitivity have usually used subjective methods for the assessment of the same. The thermoelectric probe offers a more accurate way of assessing the temperature at which the patient feels the discomfort related to dentin hypersensitivity. The intraclass correlation coefficient for the instrument was found to be 0.9849, which indicates that the instrument is reliable and can be utilized for appropriate assessment of the condition under investigation. Tarbet and associates  conducted a double-blind comparison of the effect on hypersensitivity of 33% sodium fluoride paste. A significant reduction in hypersensitivity was reported on the third and seventh day following application. In the present study, there was no significant difference in the reductions in dentinal hypersensitivity between the two dentifrices at the end of 12 weeks. In a similar study conducted by Hu et al.,  there was no statistically significant difference in tactile and air blast sensitivity compared to the commercially available positive control desensitizing dentifrice at the end of 8 weeks. West et al., found no significant differences in reduction in dentinal hypersensitivity as assessed by tactile and cold air stimuli between three dentifrices containing strontium acetate, potassium nitrate and fluoride dentifrice at the end of the 6-week period. The results of the present study are in contrast to those observed by Schiff et al.,  who found statistically significant improvements in tactile and air-blast sensitivity with a new dentifrice containing 5% potassium nitrate and 0.454% stannous fluoride in a silica base as compared with positive and negative controls at the end of the 8-week period. In another study by Schiff et al.,  subjects using 5% potassium nitrate demonstrated statistically significant reductions in dentinal hypersensitivity to tactile, thermal and air-blast sensitivity as compared to a placebo dentifrice without potassium nitrate, at the end of 12 weeks. Silverman et al.,  observed statistically significant reductions in dentinal hypersensitivity to cold air, tactile stimulation along with patient's subjective assessments with the use of 5% potassium nitrate at the end of 4 weeks as compared to a placebo dentifrice. Kanapka  observed that development of more effective desensitizing dentifrices will depend on standardization in clinical design, especially regarding stimulus choice and mode of application. Holland et al. noted that a range of sensitivity levels should be included and the study should be conducted for durations of at least 8 weeks. The current study was conducted with these pertinent issues in mind, employing a randomized controlled design, with subjects having a range of sensitivity levels and for a period of 12 weeks. The study also employed a thermoelectric probe, which provides for an objective assessment of dentinal hypersensitivity. The results of the present study show that both the test products were equally effective in reducing the dentinal hypersensitivity of the study subjects over a 12-week period. However, Anchor toothpaste might provide a means of alleviation of dentinal hypersensitivity at a reduced cost, which may be an important factor in developing countries such as India. In conclusion, both Anchor toothpaste and Colgate Total showed significantly reduced dentinal hypersensitivity among the study subjects over a period of 12 weeks. However, there was no statistically significant difference between the two products tested. Nevertheless, economic considerations could render the former better suited to this region. With a burgeoning middle-class in developing countries like India, the product could find more usage considering that is proven to be as effective as established benchmarks, while concurrently more cost-effective. This study was supported by Anchor Health and Beauty Care Pvt. Ltd., Mumbai, India. The authors are also grateful to all those who were directly and indirectly involved in the study. 6. Scherman A, Jacobsen PL. Managing dentine hypersensitivity: What treatment to recommend to patients. J Am Dent Assoc 1992;123:57-61. 29. Schiff T, He T, Sagel L, Baker R. Efficacy and safety of a novel stabilized stannous fluoride and sodium bexametaphosphate dentifrice for dentinal hypersensitivity. J Contemp Dent Pract 2006;7:1-8.
arjun torwane, n. and hongal, s. and goel, p. and chandrashekhar, b.r. and jain, m. and saxena, e. and gouraha, a. and yadav, s.